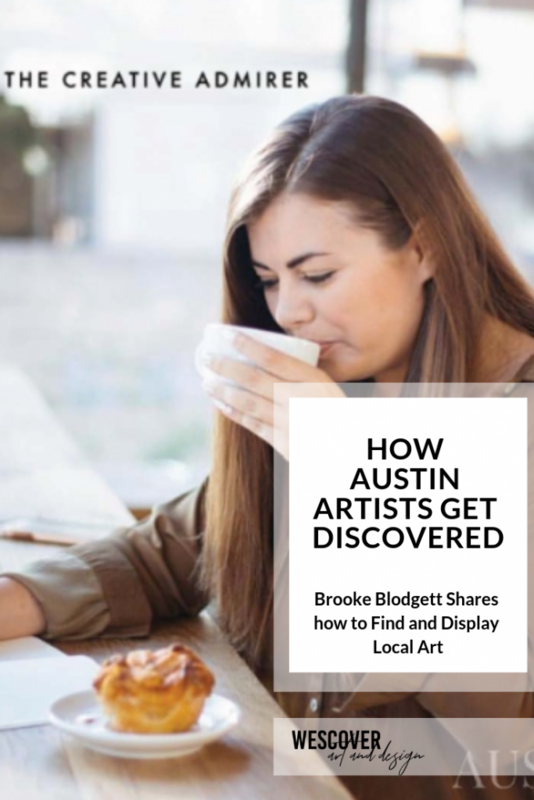 Brooke Blodgett is The Creative Admirer. She has a passion for finding unique, local design in Austin, Texas, and her blog is full of creator features (including some Wescover creators like Samantha Heligman from Settle Ceramics!). She is also a creative consultant with an eye for getting discovered. We love passionate design-hunters like Brooke, and wanted to get her insight on how people like her search for new artists and pieces of stunning design. So design hunters, take notes; but also, her method for discovery can be helpful for our Wescover creators to utilize new methods for marketing their creative business. Brooke Blodgett a.k.a. the creative admirer, a design-hunter and blogger based in Austin, TX. One of my daily morning routines is to set a self-awareness around me. I often am hopping around the city for meetings and you would be surprised how many incredibly talented artists line the walls of your favorite coffee shop or ceramicist handcrafted the coffee mug your coffee was served in. These are small details that are often overlooked when you feel you don’t have time or simply have never been presented the idea to set intention around acknowledging that these details matter. They can lead to you discovering the next maker or artist you can’t wait to buy their next small-batch collection from and feeling more connected to the creative community you’re supporting. I can’t tell you how many times I’ve seen a gorgeous piece of furniture or painting in a cafe and asked where they purchased the item and *surprisingly* found out it was created by a local artist. Looked them up on social media and then was blown away at seeing the other pieces they had designed. If I’m not ready to make a purchase yet from the artist but would be interested in the future, I give them a quick follow to stay in the loop with their new creations. I briefly touched on the process I go through when following creatives above, but I take this one step further when I’m having a bit of a discovery “dry spell”. Artists love supporting other artists. They often engage with each other on social media and will promote new collections or upcoming events to display authentic community over competition. I allll about it! Honestly, this is one of my not-so-guilty ways I find new creatives or artists. If I’m not 100% certain their aesthetic is for me, I’ll save/bookmark their post and check back in later to see how they’ve innovated. I love following the journey of a creative and watching them continue to evolve their craft. Social media makes it SO EASY to discover new makers and artists. If I see the creative is located in NYC, Chicago, or LA, the next step is to see if they are on Wescover so I can learn more about their story and dive a little deeper. 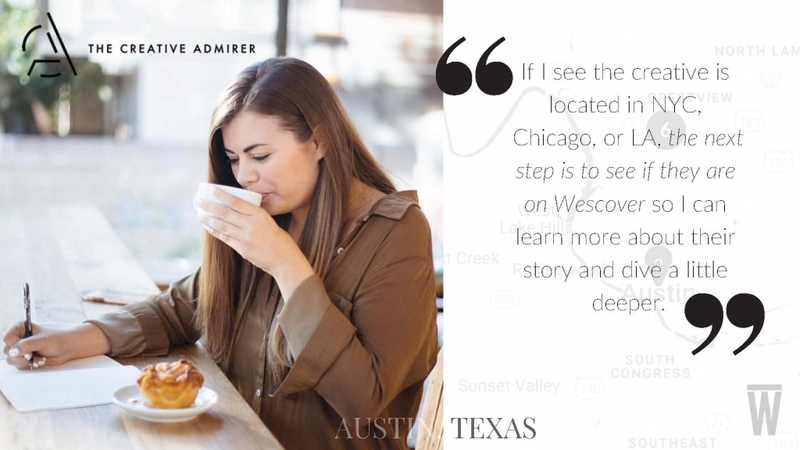 I can’t wait until Austin is listed as a discoverable city for Wescover creatives. Do you know local art & design? If you are a passionate design hunter like Brooke, we’d love to know more about your favorite Creator communities! 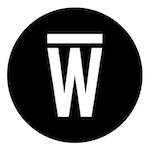 Connect with us— reach out to renee@wescover.com to chat!! If you are an Awesome Austin Creative GET ON OUR MAP!